Summer is better with Heinz! 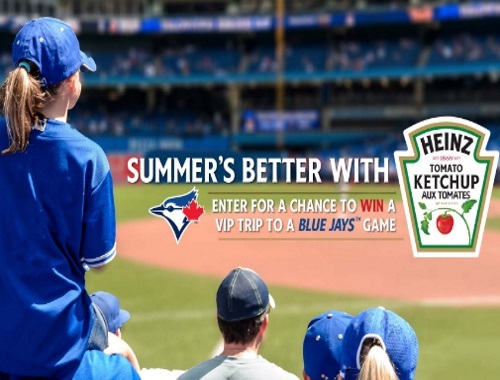 Enter for a chance to win a VIP trip to a Blue Jays game! † Airfare not included where winner resides within 300 km of Rogers Centre. 12 Heinz ketchup coupons. Each coupon is redeemable for one (1) 1L bottle of Heinz ketchup from any retailer in Canada that sells 1L bottles of Heinz ketchup. Each coupon expires on December 31, 2018 for one 1L bottle of Heinz ketchup. $20 gift card redeemable at Jays Shop retail stores located in Rogers Centre and CF Eaton Centre in Toronto.